More than 60 species of cockroach live in the United States. In Florida, common encounters include the smaller German, Asian and brownbanded cockroaches and the larger, 1 1/2- to 2-inch-long Florida woods, American, Australian, brown and smoky brown cockroaches. These larger species all belong to the genus Periplaneta, with the exception being the Florida woods cockroach. Cockroaches are sometimes called water bugs or palmetto bugs. Species of Periplaneta often originate from North Africa. The American cockroach (Periplaneta americana) isn't truly American at all, coming to the U.S. from Africa as early as the 17th century. These large roaches, reaching lengths over 1 1/2 inches, are typically found outside in moist locations. Trees, woodpiles, compost or other organic debris are favorites habitats. These roaches will, however, move indoors in search of food or water. Like most roaches, the American cockroach needs moisture to survive. As such, they will often rest in sinks and drains during the day. These are also preferred avenues of entry into houses and buildings. The Australian cockroach's common name is also misleading, as it, too, likely originated from Africa. This pest has worldwide distribution and is sometimes referred to as the greenhouse cockroach. The Australian cockroach (Periplaneta australasiae) cannot tolerate temperatures as cold as what the American roach can. It's slightly smaller than the American roach, with Australian males only about 83 percent as long as the Americans; females are 92 percent as long as their American counterparts. Like the American cockroach, this species prefers to be outside, but can and will infest in large numbers in the subtropical climate of Florida. Aside from size, Australian cockroaches are distinguished from American and brown cockroaches by a yellow streak on the edge of each forewing. The brown cockroach (Periplaneta brunnea) closely resembles the Australian and American cockroaches, although this roach is slightly darker than its American counterpart. The brown roach is approximately the same length as the American cockroach, but slightly wider. Another difference is that the brown cockroach's wings do not extend past the tip of the abdomen as they do in American cockroaches. This species is more tropical in nature than the others; its range is from the Carolinas south to Florida and then west to Texas. Outdoors, it prefers many of the same habitats as the American cockroach. The smoky brown cockroach (Pariplaneta fuliginosa) is native to Asia. Again, this species closely resembles the other three members of Pariplaneta, except it's uniformly dark brown or mahogany to black. The wings are longer than their bodies. Like the other species, these large cockroaches prefer moist, dark locations outside, but can infest structures in large numbers. Leaky roofs are a major attractant for these roaches. The Florida woods cockroach (Euryycotis floridana) is a rare invader of homes, although it's sometimes transported indoors on firewood or other organic material. Out of all larger cockroach species found in Florida, these are the only North American natives. These large roaches grow to over 1 1/2 inches long and up to 1 inch wide. Their wings are ineffective for flight; they form short pads just behind the head and don't cover any area of their abdomen. 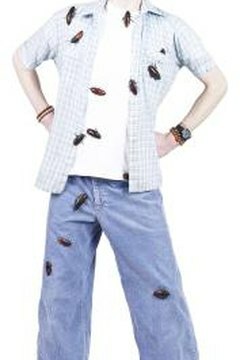 These large roaches are reddish-brown to nearly black, often uniform in color.